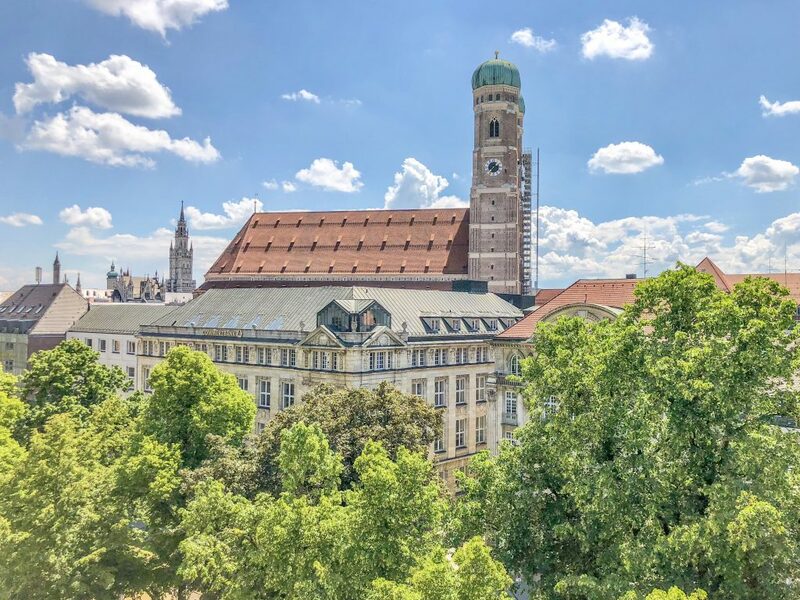 Munich is my favourite German town and a place that brings me dear memories – I called it home for 5 years and in Munich I achieved my Master in Law in Intellectual Property at the Max Planck Institute. I cannot imagine a better place to enjoy those years of fun student life. I made amazing friends, learned lots of new things (including German) and above all, I felt very welcome and truly at home. 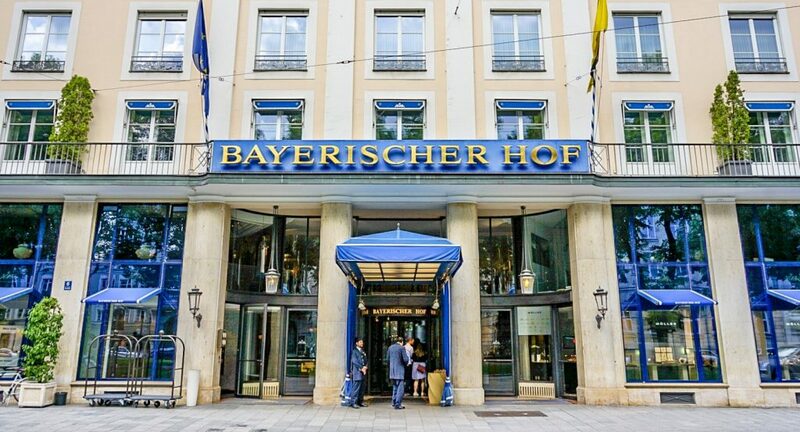 Bayerischer Hof was quite present in my life because this was the hotel I recommended to most of the people who visited me (and would not stay at my house). The Falk’s bar was also a place I would take my guests to due to its beauty and amazing history, which I will describe a bit further down in this article. King Ludwig I was on the throne when the Bayerischer Hof first opened its doors to guests in 1841. Much has changed since then, but from day one the hotel on Promenadeplatz has been a meeting place for people from all over the world. It has stories about architects and musicians, kings and presidents, Hollywood stars and authors who shape the hotel to this day. 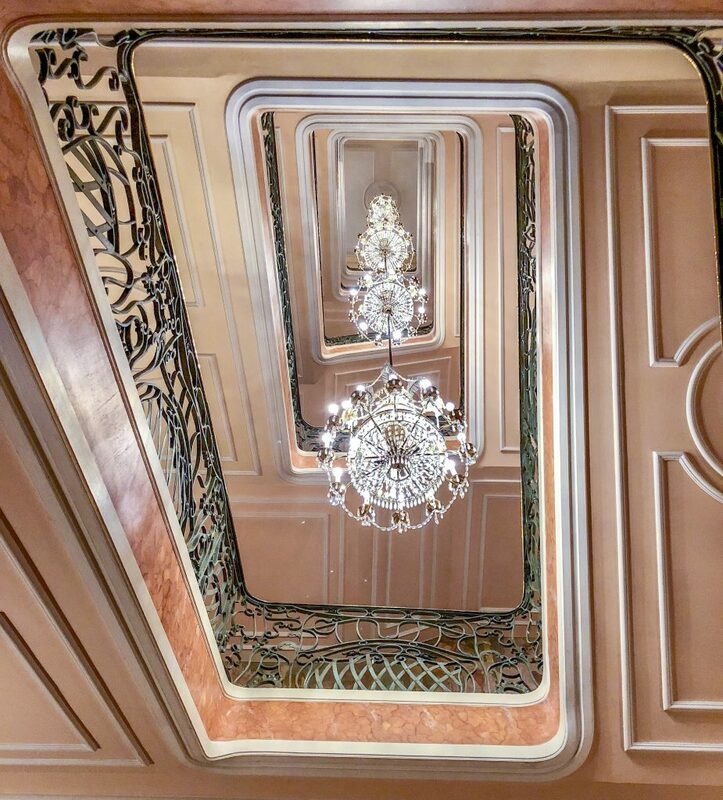 Bayerischer Hof has changed and grown over time and this is why it is so much more than a luxury hotel – it is a world in itself. I was quite familiar with the hotel but never stayed in it. 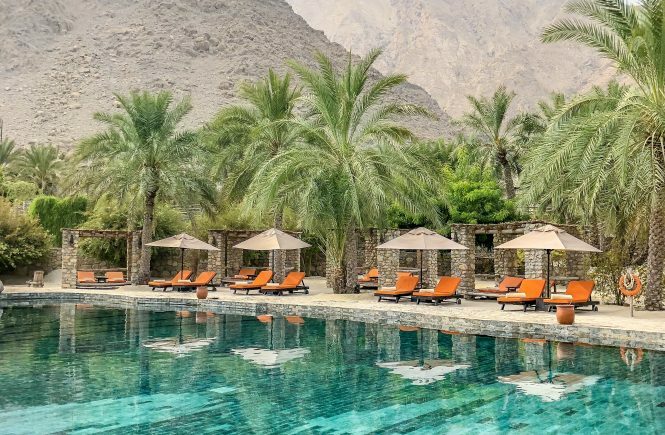 It was a great surprise to find the property at Preferred Hotels webpage while searching for some travel inspirations. I got so excited that I booked my suite as soon as I saw it. Haha! If you are as anxious as I am and cannot wait to finish reading the post to book your stay, go ahead and reserve your suite here. 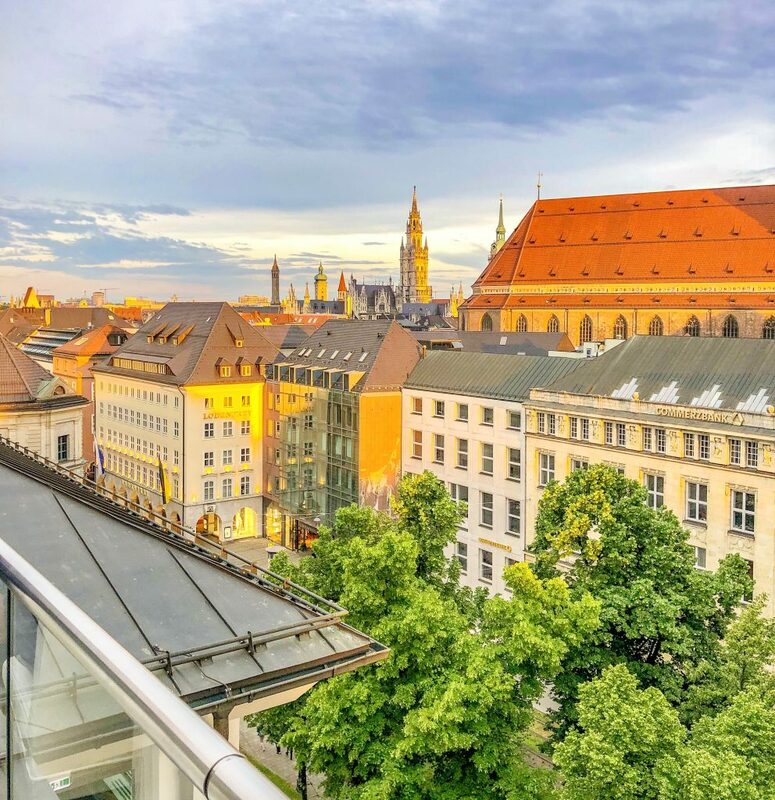 Situated in the heart of Munich’s historic centre, the hotel boasts 337 luxurious rooms and 74 suites, five restaurants and six bars, 40 function rooms, a health and beauty oasis and top-notch entertainment. As soon as we set foot in the hotel we had the sense that this was a luxury establishment with a personal touch. Even better, we enjoyed the warmest reception. Exactly how I like it and I was sure that some amazing days were about to come. In. The. Heart. Of. The. City!!! A location which is hard to beat, guys! 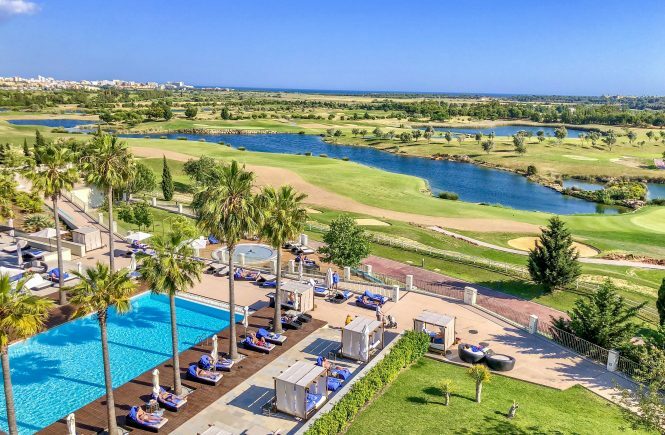 Most of the important points of interest are located within short walking distance, the views (specially from the rooftop) are stunning, all the great and posh shops are around as well as some of the best restaurants in town – actually, some are IN the hotel. 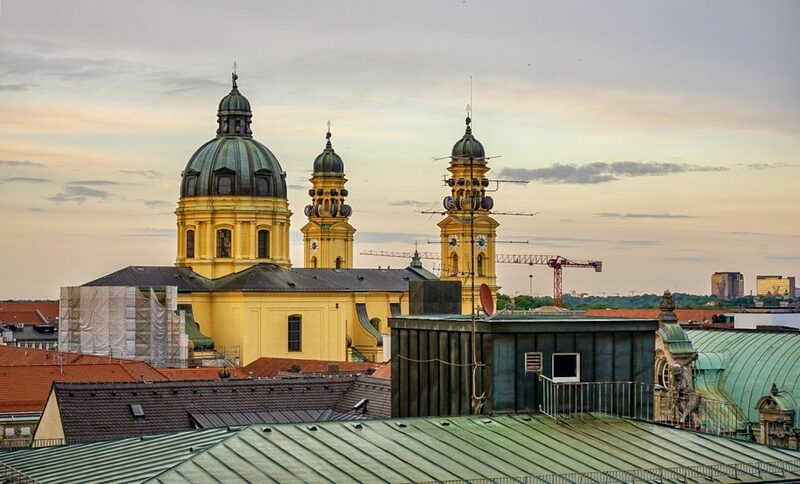 Staying in the Old Town district of Munich is not only very pretty but also super handy. It allowed us to enjoy the city and to go back to the hotel for a shower, a short nap or even better – to enjoy the spa, which was our favourite activity during this trip. I felt homesick. Once I got back home! Hahaha! I mean it! 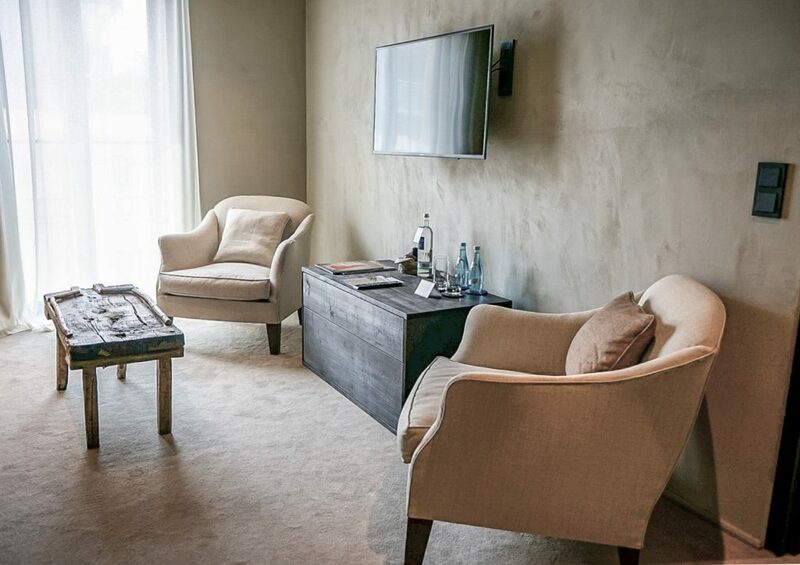 Even if the days of the Bavarian monarchy are long gone, the highest standards of rooms and suites have remained. 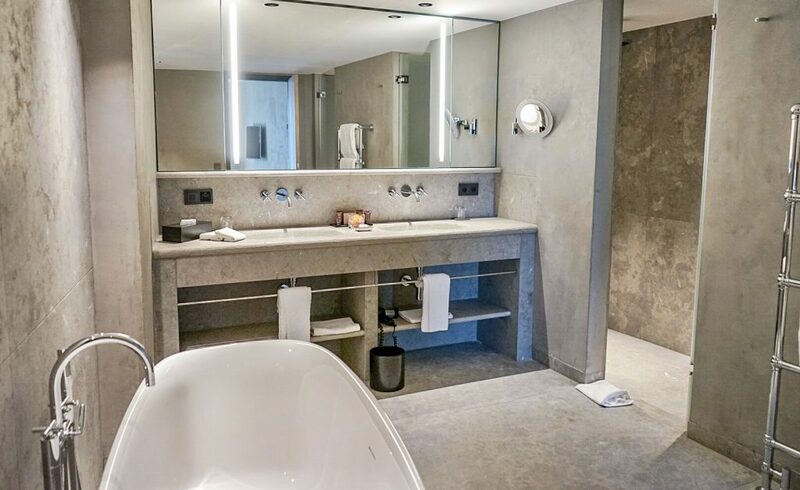 Guests can stay in a stylish ambience, enjoy comfortable furnishings and lovingly designed details and delight in the wonderful spacious bathrooms. 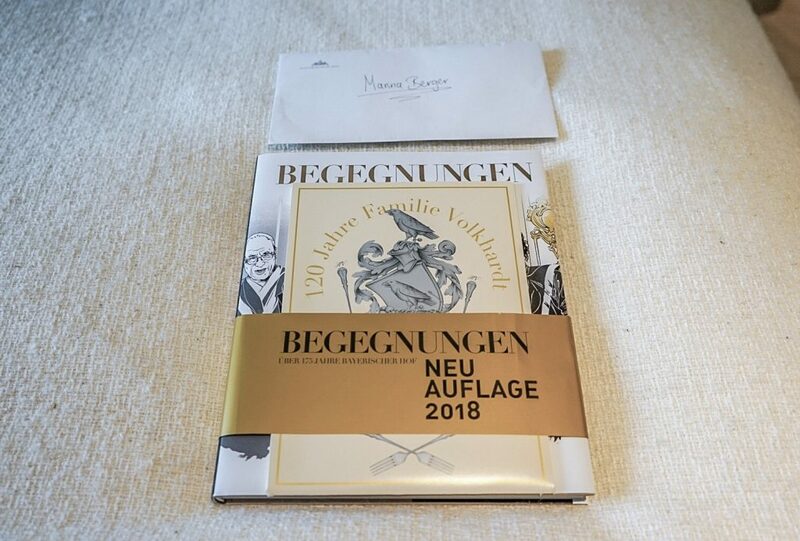 Despite all the comfort, guests are required to make a difficult choice: select from 350 unique rooms as no two rooms in the Bayerischer Hof are alike. 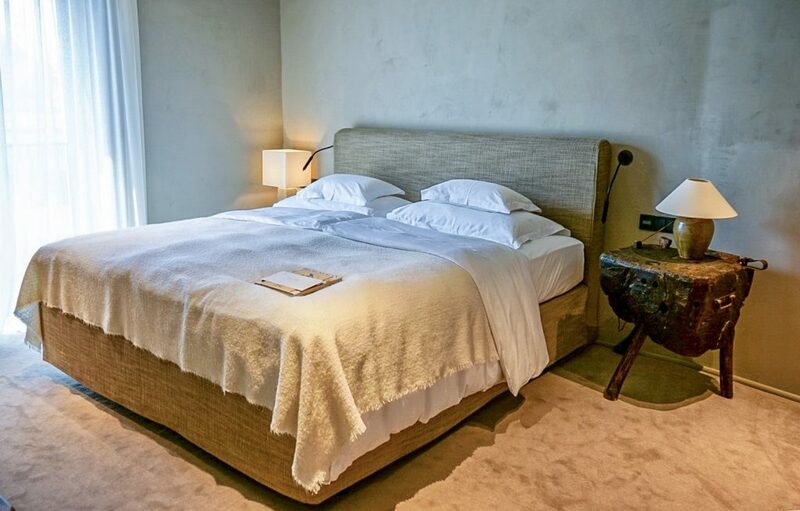 We can choose between the rather classic design like the cheerful rooms in country-house style, the elegant rooms designed by star architect Siegward Graf Pilati, the romantic rooms designed by Laura Ashley, the Urban cosmopolitan R&B rooms or the African inspired colonial rooms and so on. 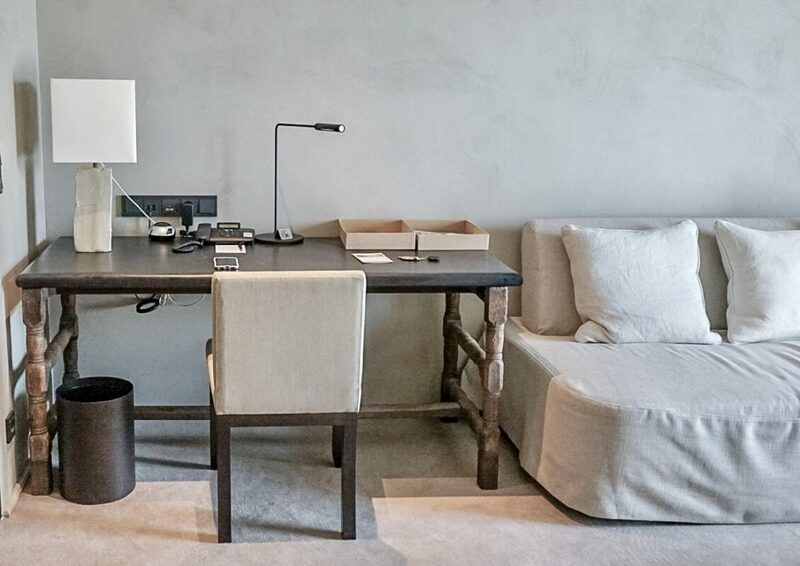 I chose to stay in a suite designed by top Belgium interior designer and art dealer Axel Vervoordt I actually became a little bit obsessed about him after my stay and it was the best choice I could have ever made. Deeply recommend it!!! 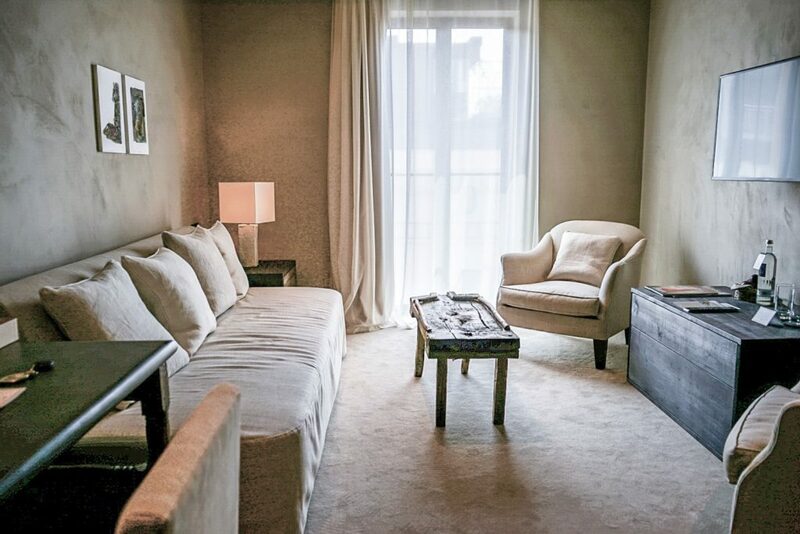 The suite is very new, spacious, bright, full of character… and so warm, unpretentiously luxurious and discrete. 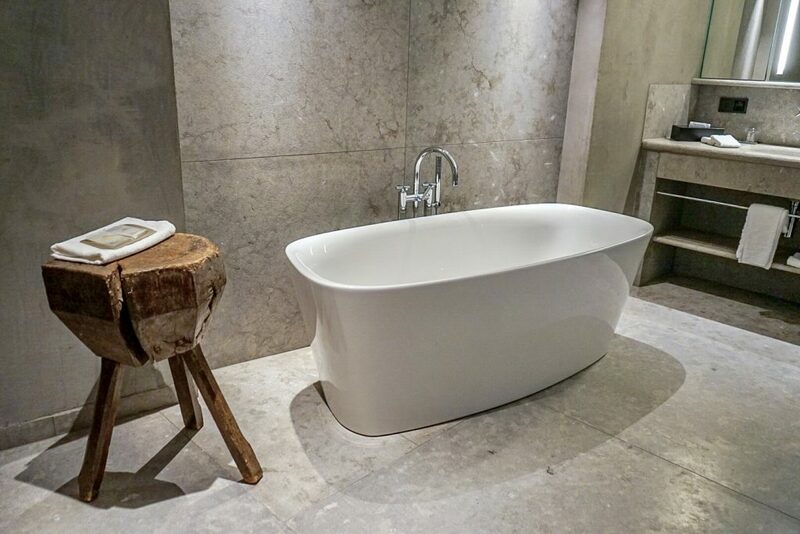 The walls are painted in natural earth tones and artisans breathed new life into each piece of antique, minimalistic furniture. Beautiful! We had a walk-in closet, a living room, a bedroom and a fantastic bathroom with a huge bath and walk-in shower. 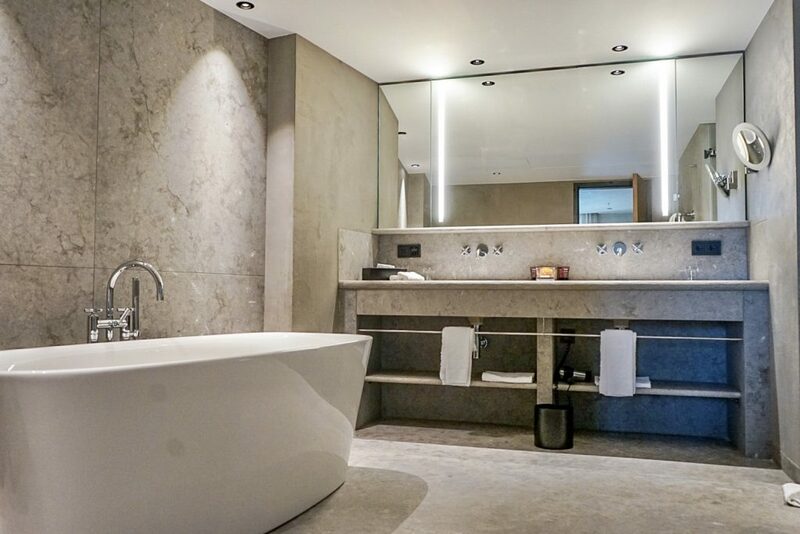 The entire suite was extremely spacious but honestly, size was not what called my attention – it was the attention to the detail and elegance as well as some “effects” that conquered my heart. By “effects” I mean the materials used which played with our senses – an example are the stones used in the walk-in shower which release a delicious and very delicate smell of nature once they got wet I had to take five showers a day to smell that. Hahaha! and sweet little details in the handmade wooden furniture as well as the also handmade lamps from Japan. Sooooo special!!! And, so amazing, we found a note of the designer himself about “how to live a room”. In this little note he explains that situated in the busy heart of Munich, the room had been imagined to experience silence and space for the mind and that he believes that the 21st century is a century of recuperation and respect for Mother Earth – this is why he decided to give new life to old, minimalistic furniture. I admit that it made me look at our room with totally different eyes and enjoy it even more. In view of the above, there is no doubt about what my favourite rooms would be, right?! 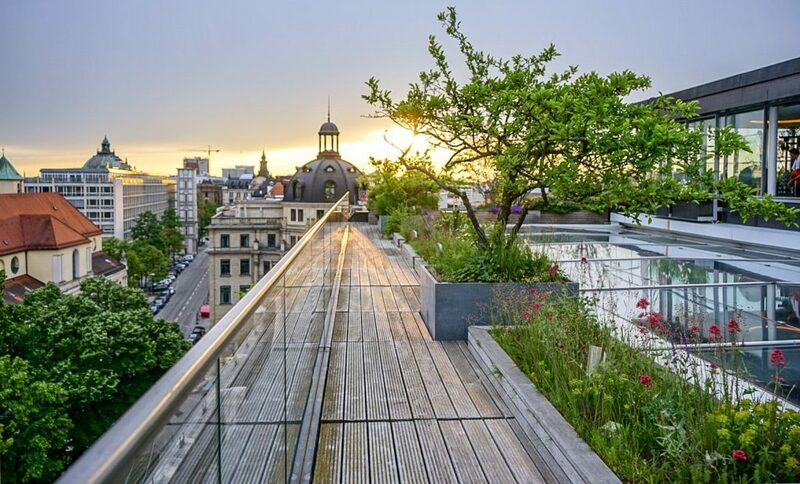 Axel Vervoordt also signs the Penthouse Garden Suite and even though I unfortunately did not see it with my own eyes, I fell in love with the photos. 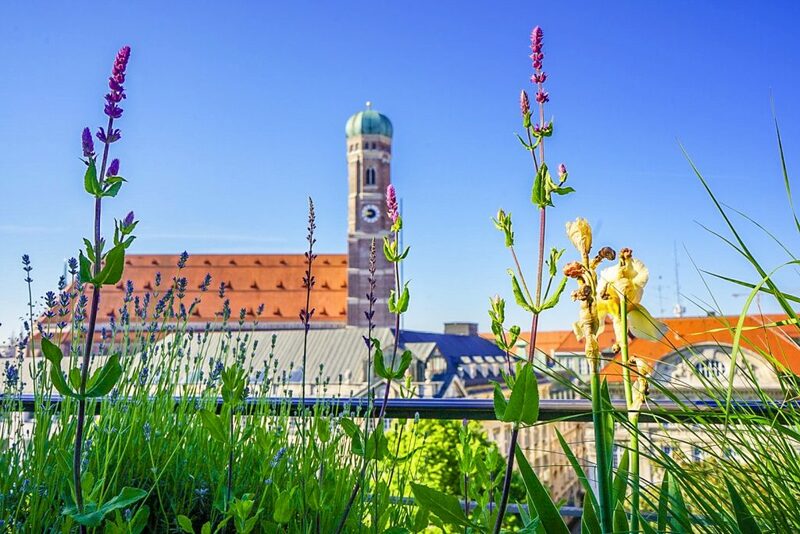 The gorgeous design of the 350sq m suite with a terrace overlooking the towers of Frauenkirche Cathedral sounds like something out of this mundane world. 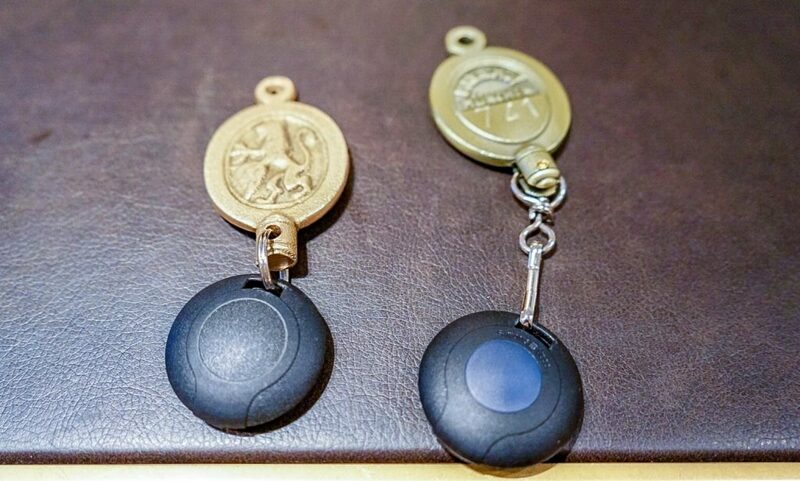 Still, I am very curious about the other rooms & suites as not even the room keys in the hotel are looking the same. Maybe Bayerischer Hof should organize some room tours. Haha! Or maybe I could spend more than a year in the property – One room per day. Offer made! Who knows, right?! 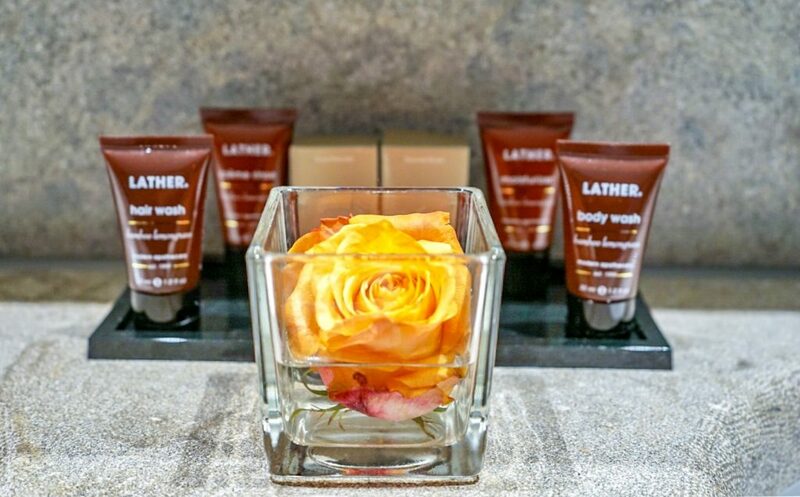 Amenities are Lather, which I LOVE! 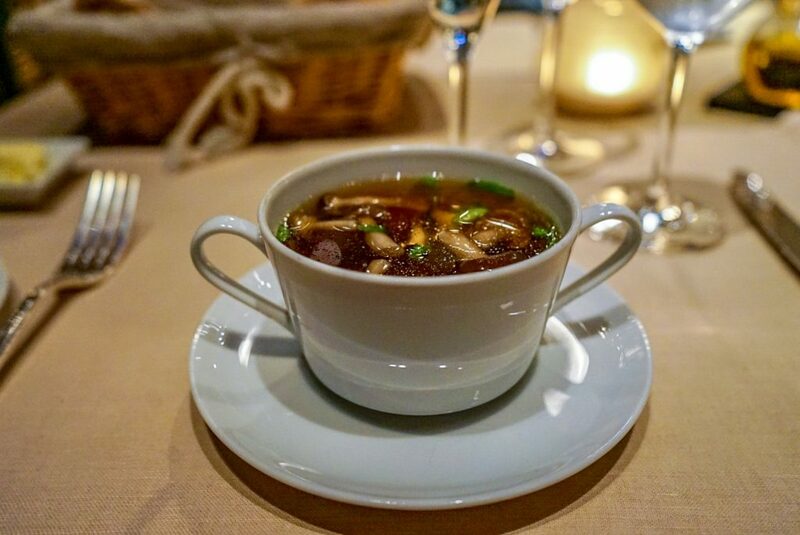 Leave all your toilette articles at home and indulge. 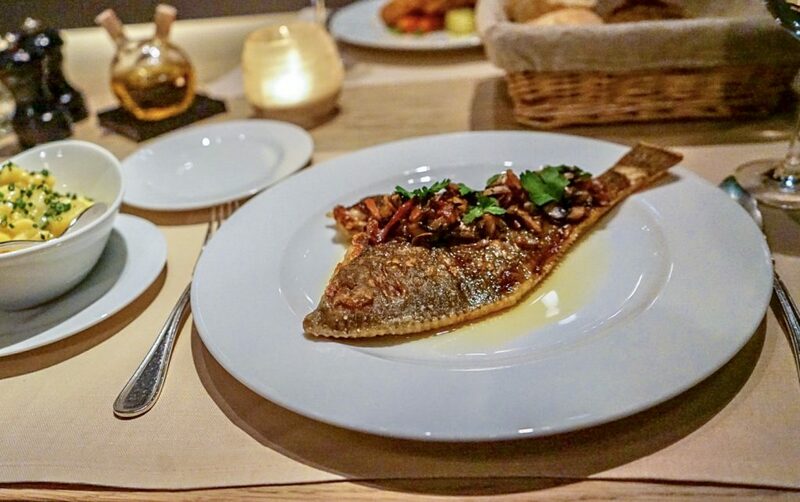 There are 11 restaurants and bars at Bayerischer Hof. Eleven!!! 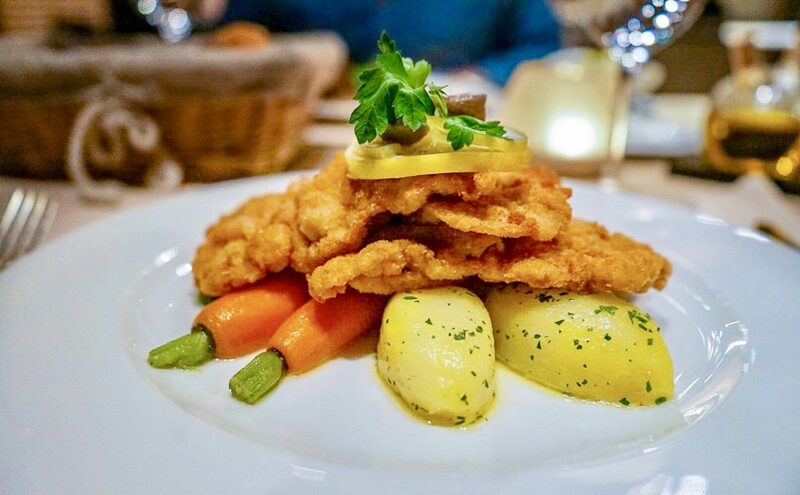 With such a huge range of options, we can pretty much be sure that there is the right cuisine for each guest and taste – options range from the best restaurant in Munich to a very typical and down to earth Bavarian eatery. I did not have the time to try all the restaurants Wow! I am finding such amazing excuses to come back! but everything I tried exceeded my high expectations. 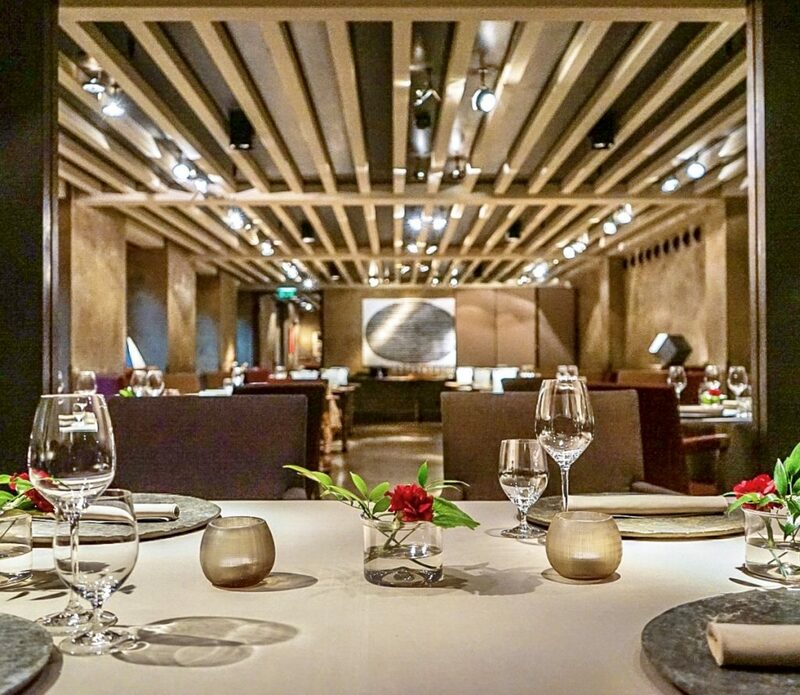 3 Michelin stars, 18 Gault-Millau points, 10 Pfannen (pans) by Gusto, 4,5 F by Feinschmecker, one of the 50 best restaurants in the world. Do I have to tell you more? Well, actually yes! 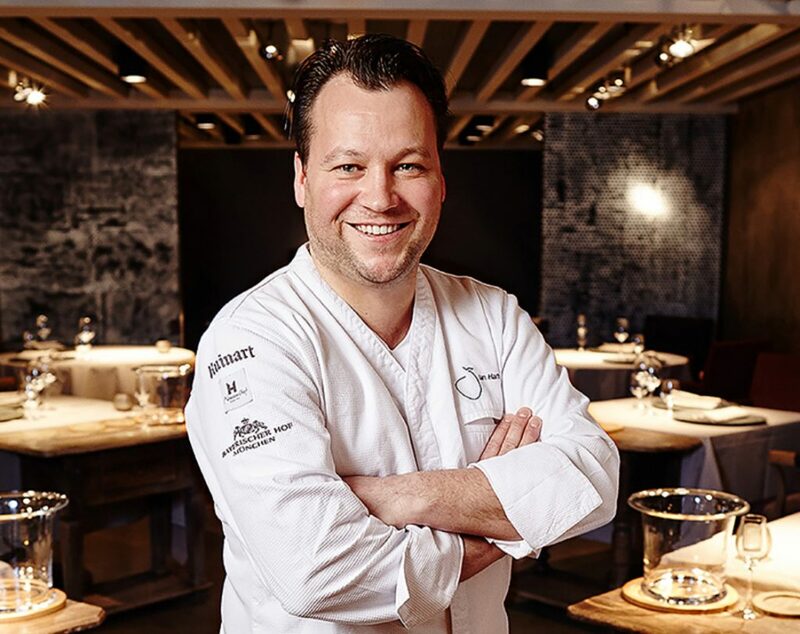 Young and talented head chef Jan Hartwig, restaurant manager Jochen Benz and their team turn culinary perfection into fine art in an artistic interior, also designed by Axel Vervoordt, who is responsible to most of the details, including uniforms. 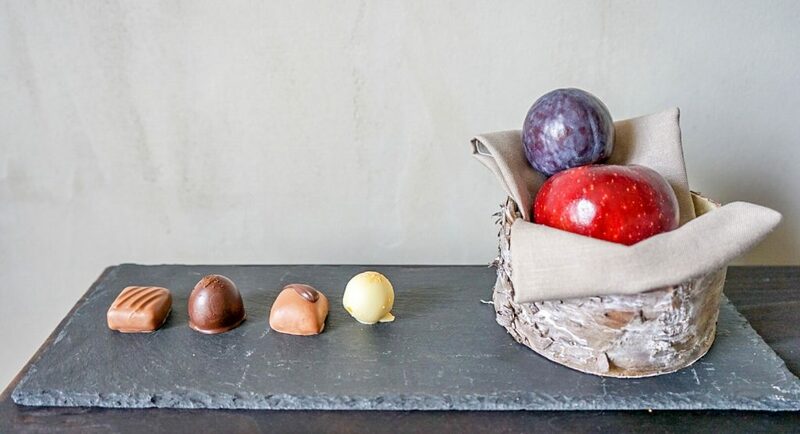 Jan Hartwig’s tasty culinary creations are masterpieces of balance and intensity and a delight to French creative cuisine lovers or any gourmand, I am sure. 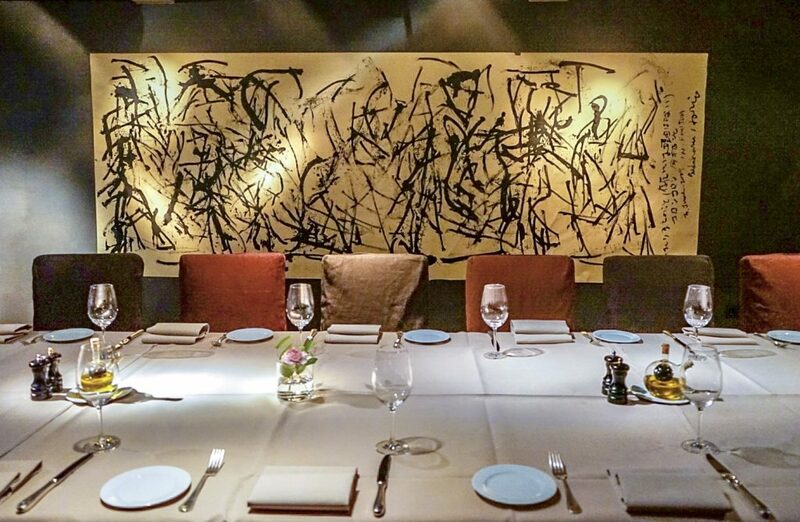 The atmosphere is very discrete with beautiful lighting and only a few tables. Everything minimalistic. 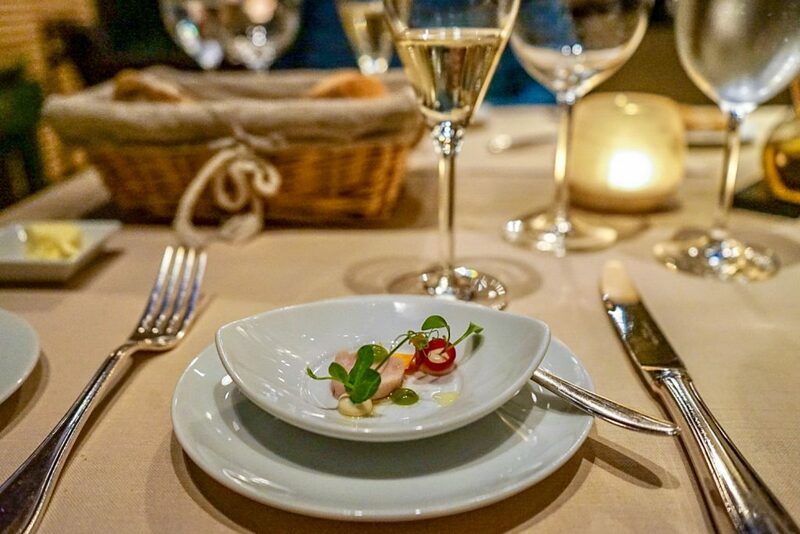 Service is very attentive and Jochen Benz was so lovely, taking time to explain us a lot about the restaurant – the first 3 Michelin stars restaurant in years in Munich and now also listed among the 50 Best restaurants of the world. And all of that in only a few years! There is also a beautiful garden terrace which was closed during our visit. 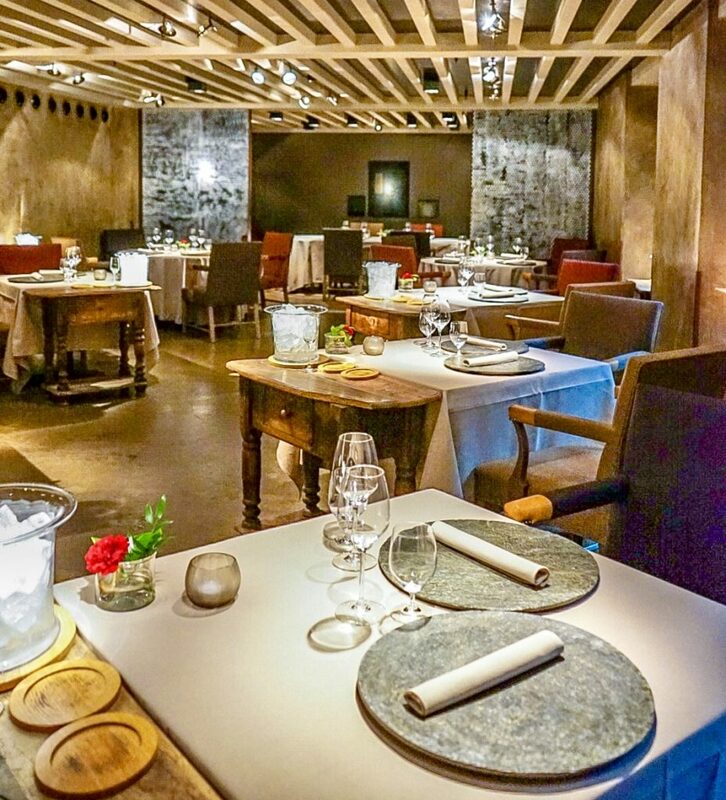 15 Gault-Millau points to proven classics and brasserie dishes with a modern twist in an interior with a very particular look by Axel Vervoordt. It was my favourite restaurant of the trip and a very amazing place to discover. During my time in Munich it still didn’t exist and, therefore, this was my first time dining at Garden. 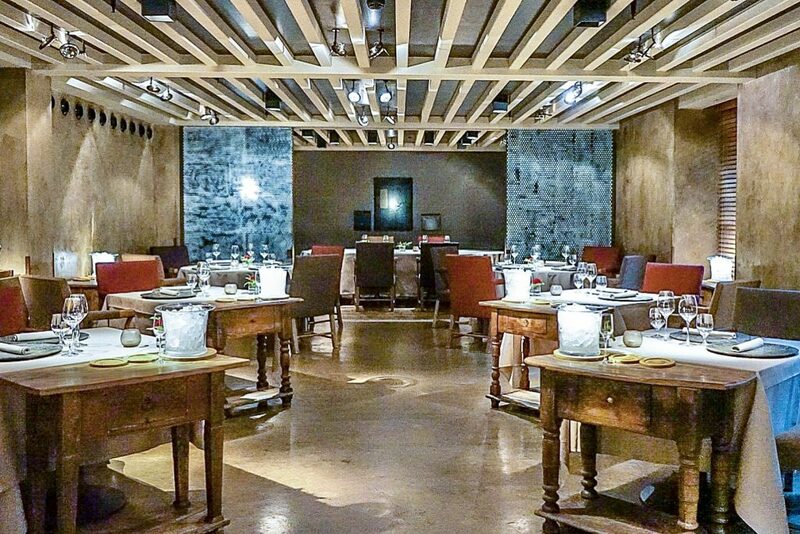 Attentive and very sympathetic service, beautiful design (very particular, like an industrial-style artist’s studio), a great wine list and food… food was YUMMY! We dined there twice and I can´t tell which meal I preferred. 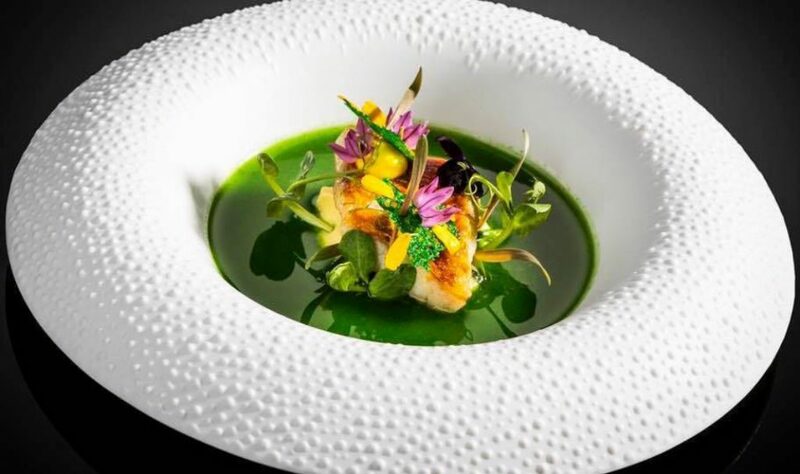 The focus is on light cuisine with more vegetables and fresh herbs. Love it! There is a cute garden terrace but we took a table inside both days because despite of the beautiful sunny weather it became a bit chilly at night. Moreover, it looks like a wonderful place for hosting an event as the Garden saloon is really cosy and pretty. 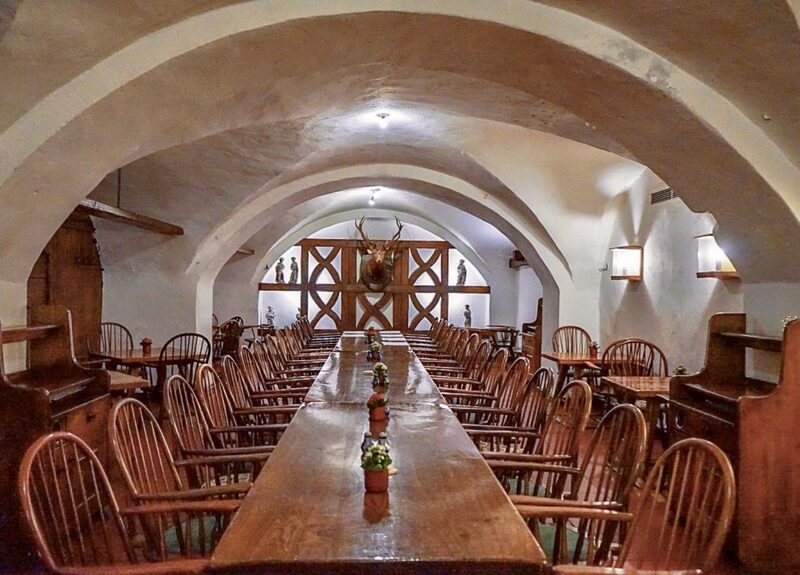 Bavarian specialities under a historic vaulted ceiling and pretzels from its own bakery. A great option for people who want to go typical. The solid vaults of the Palais Keller date back to 1425. 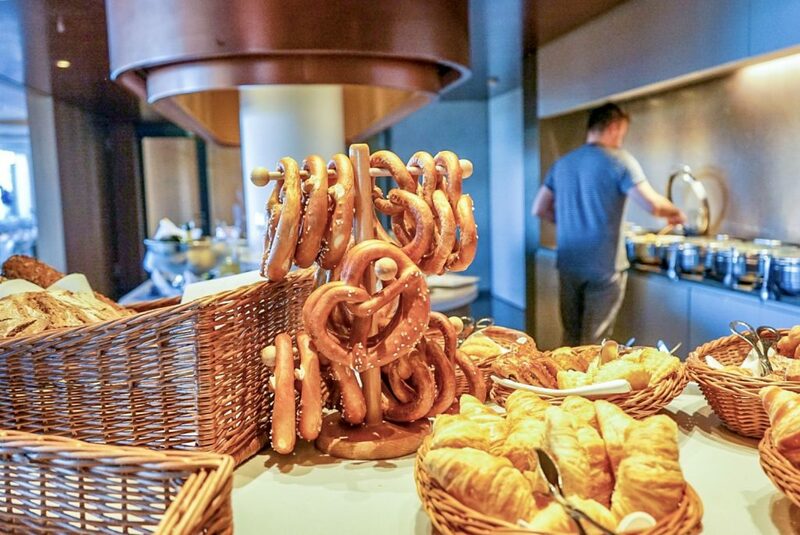 Originally a salt store, the cellar now plays host to locals and guests from all over the world who value genuine Bavarian specialities: from the traditional Weisswurst breakfast through to the Sunday jazz brunch (October to May). 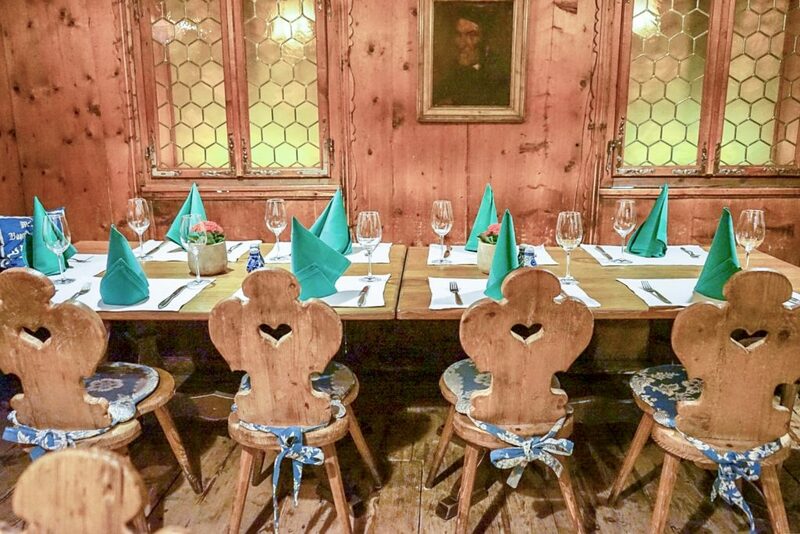 Expect a relaxed atmosphere, lots of locals and Bavarian hospitality. Polynesian specialities from a beech oven, cooked to original recipes. I didn’t give it a go but nights there sound to be very lively. Some people go for dinner while others choose to go for a drink and some music. Love! Love! Love this place! For sure the best view in town! 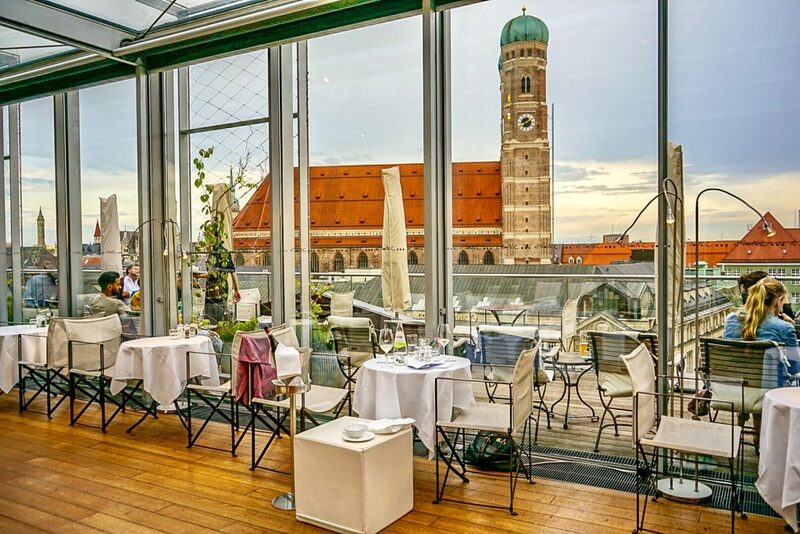 Want to have a coffee, a cocktail or a glass of champagne with a light snack and an unforgettable view of the Frauenkirche Cathedral and the towers of Munich downtown?! This is the place to go! 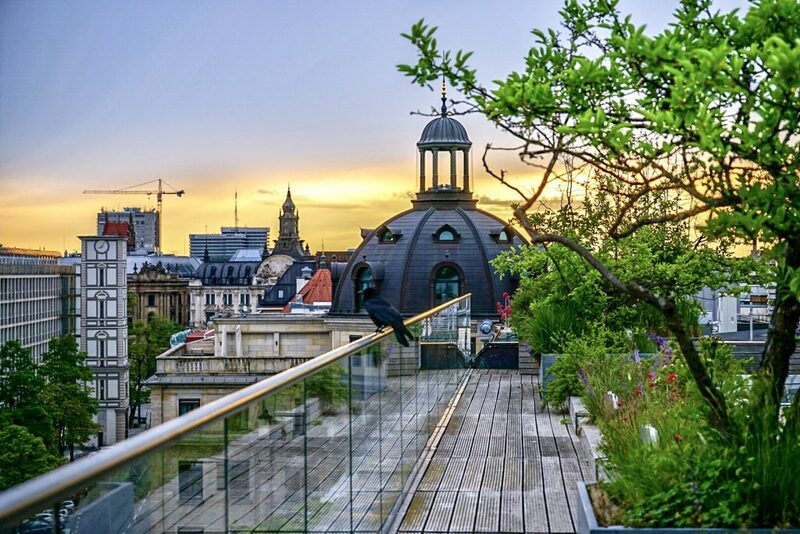 Extra cool during sunny days when it is possible to sit outside but also nice during winter as the Winter Garden, designed by star architect Andrée Putman, opens up a panoramic view over Munich’s rooftops, whereas the open fireplace invites to some calm moments of contemplation. We had lots of glasses of champagne maybe too many. Ops! and yummy meals in this place! 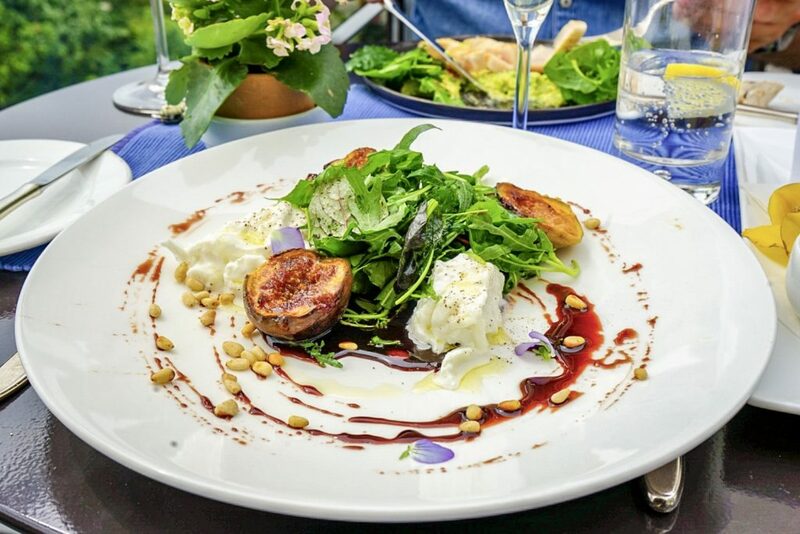 Try the burrata with figs. Delicious! 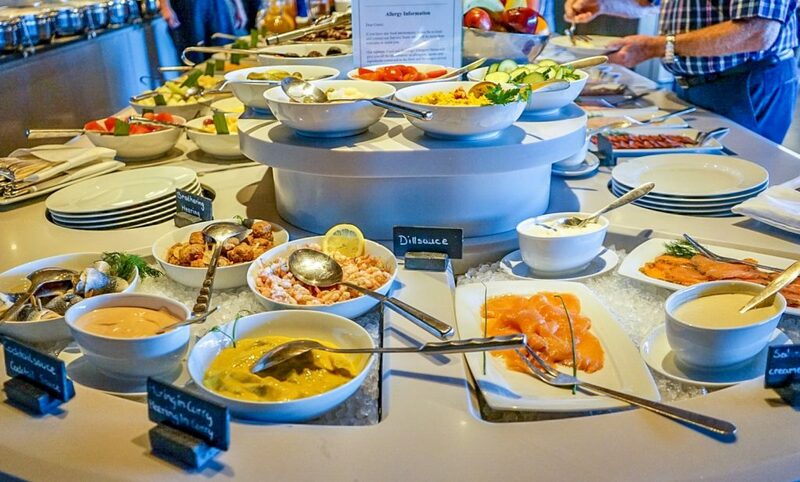 Champagne Breakfast Buffet is the name of the game!!! Soooo perfect! 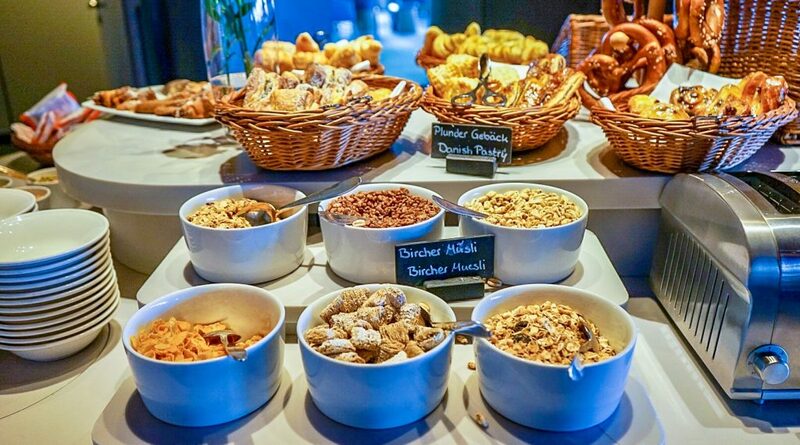 There is a wide selection of freshly prepared dishes, all types of natural and detox juices, typical Bavarian sweets and breads, a huge variety of fruits, yogurt, müsli… and everything else that might come into your mind. Haha! Ah! 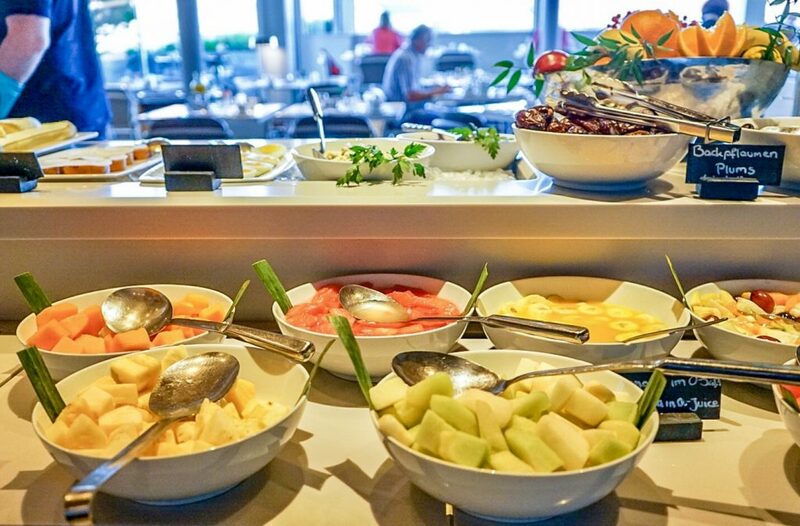 Freshly prepared eggs, omeletes, pancakes and more are prepared in front of our eyes in an open kitchen or taken to our tables after being freshly cooked. 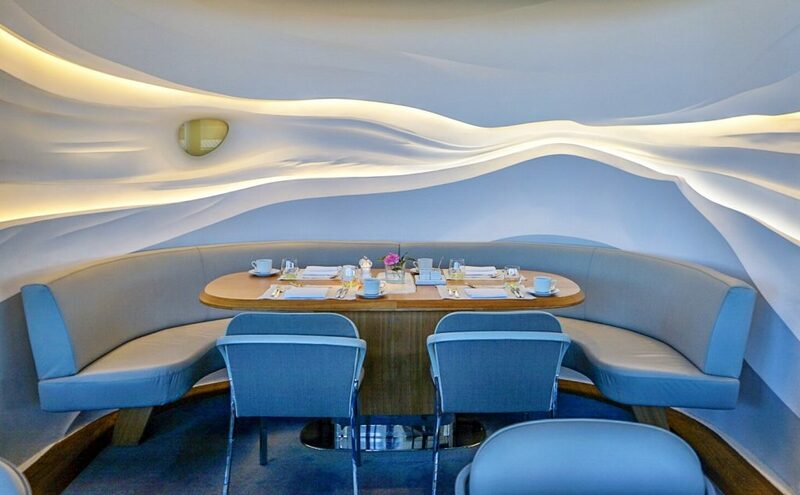 I fell in love with the very modern and upscale interior, to later understand why: it is signed by super cool Paris design studio Jouin Manku. We always chose to sit outside, of course! The stunning view cannot be missed, folks! 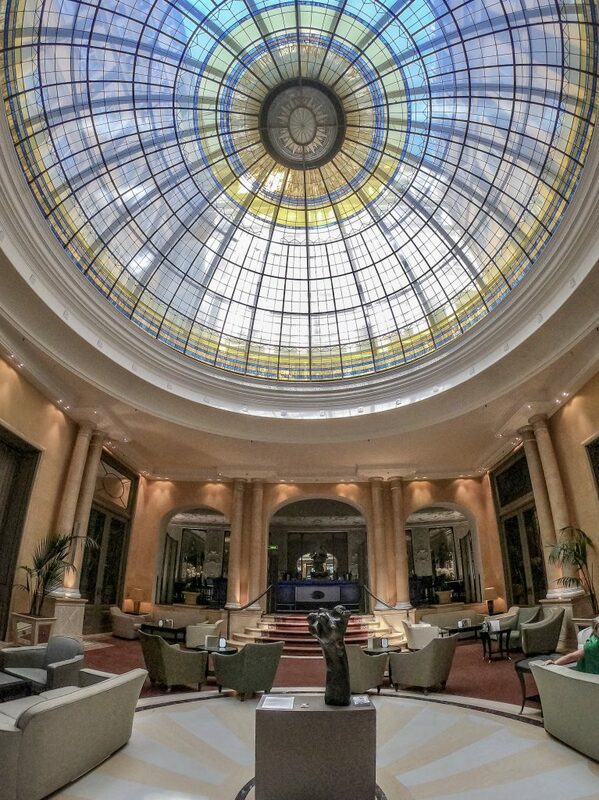 This is when it becomes crystal clear that we stay in a Grand Hotel. 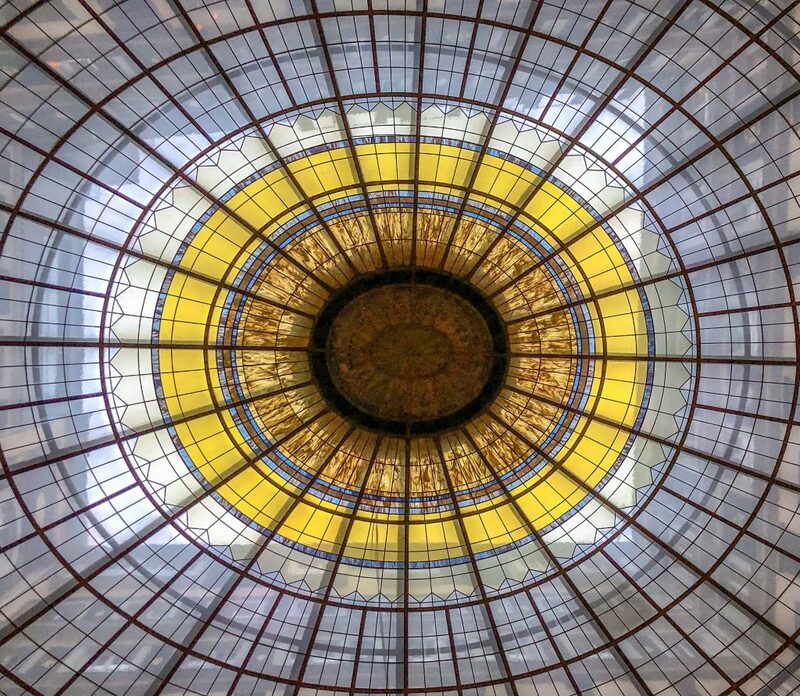 In the end, where else can we enjoy small dishes, coffee and cake and classic beverages under such an imposing glass dome? 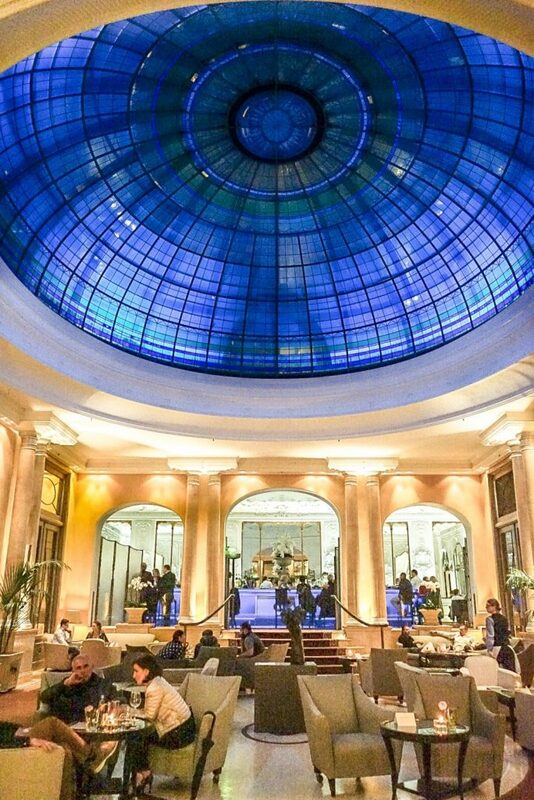 This is the heart of Bayerischer Hof and a great place to see and be seen. Haha! I admit that I could sit hours in one of the comfy chairs sipping a glass of champagne and just watching people. During the time I spent there, I realised that the place is quite popular among locals. A must see in the city even if it is only for a glass of water. 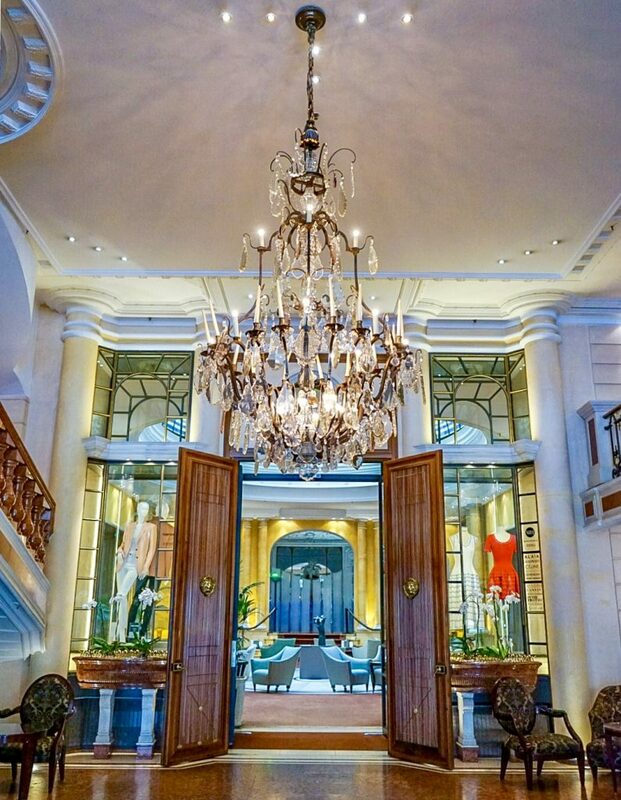 Do it because the historic hall of mirrors deserves to be seen. You will not regret it! I used to take all my guests to see this bar when I lived in Munich and they were always enchanted! 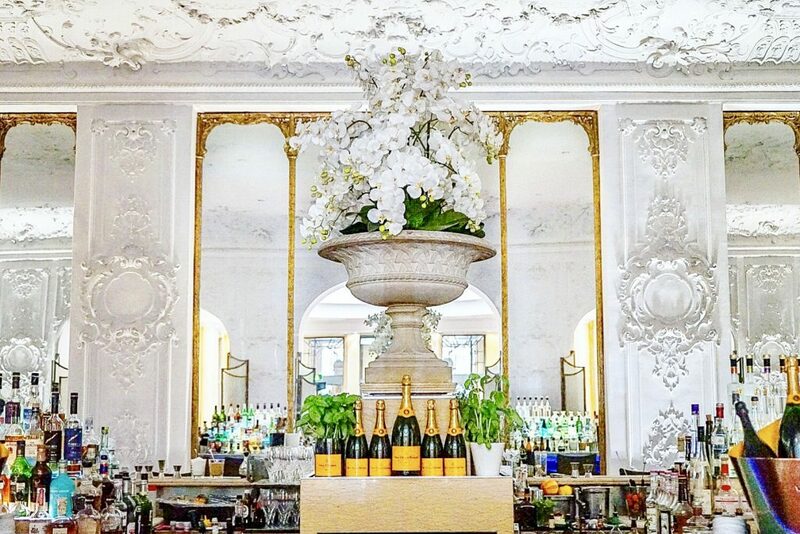 Falk’s Bar is located in the famous hall of mirrors dating back to 1839, the only room at Hotel Bayerischer Hof to survive the Second World War unscathed. 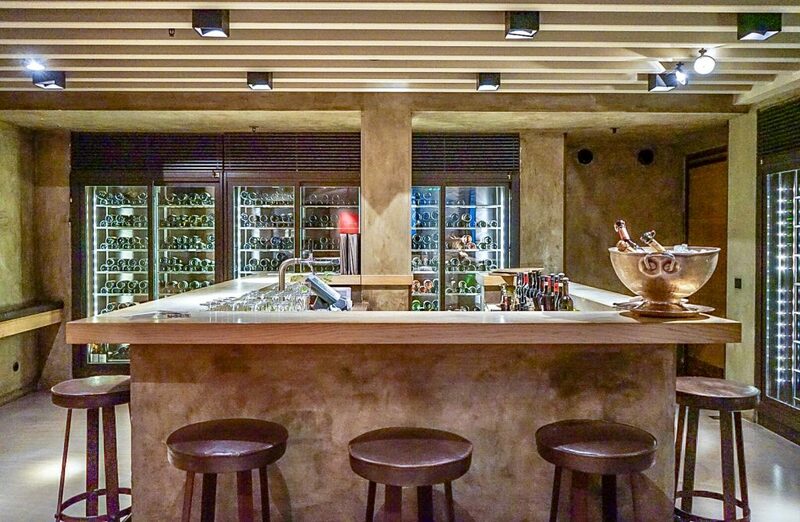 The white walls are full of details and the adorned stucco ceiling plays really well with the colours of the bar. A single glance at it can take us to another time period. This is where we enjoyed finishing our nights and I definitely recommend the famous cocktails prepared by the skilled bar team or a glass of wine while enjoying the interior. We didn’t go because we wanted to wake up early and enjoy the day. Nevertheless, we had a short look at it and wow! Music was loud and people were dancing! Might be fun. 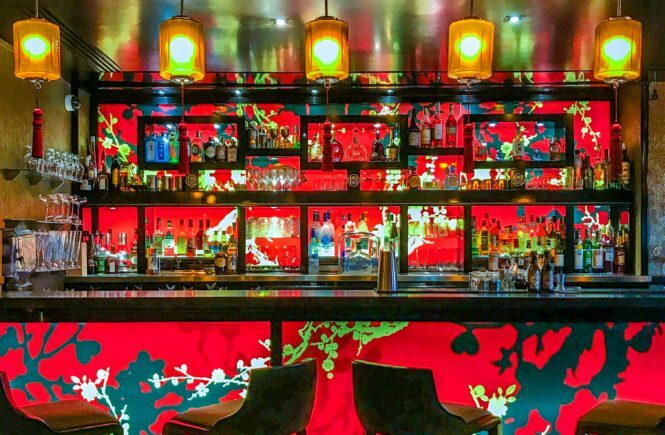 The popular Piano Bar offers good music and good drinks in a relaxed atmosphere. Renowned pianists are on site every Friday. 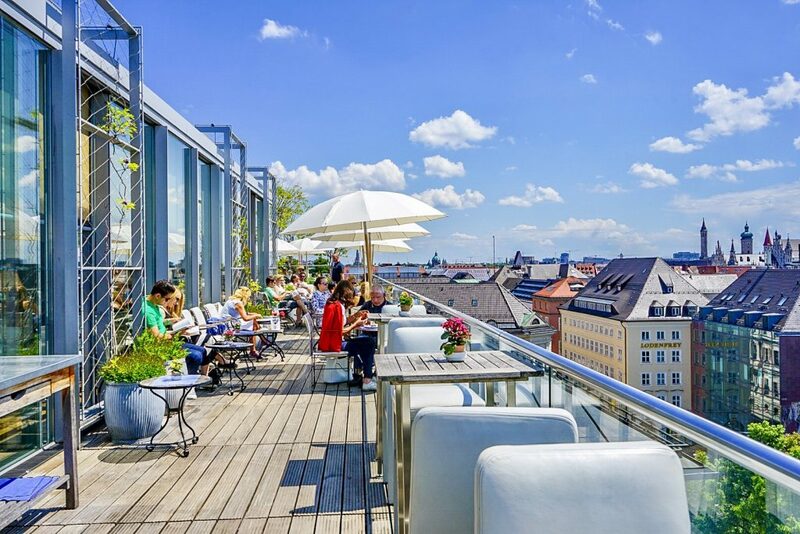 Looking forward to visit Bayerischer Hof during winter time to enjoy this icy hotspot with wind-protected bench seats and fire places. 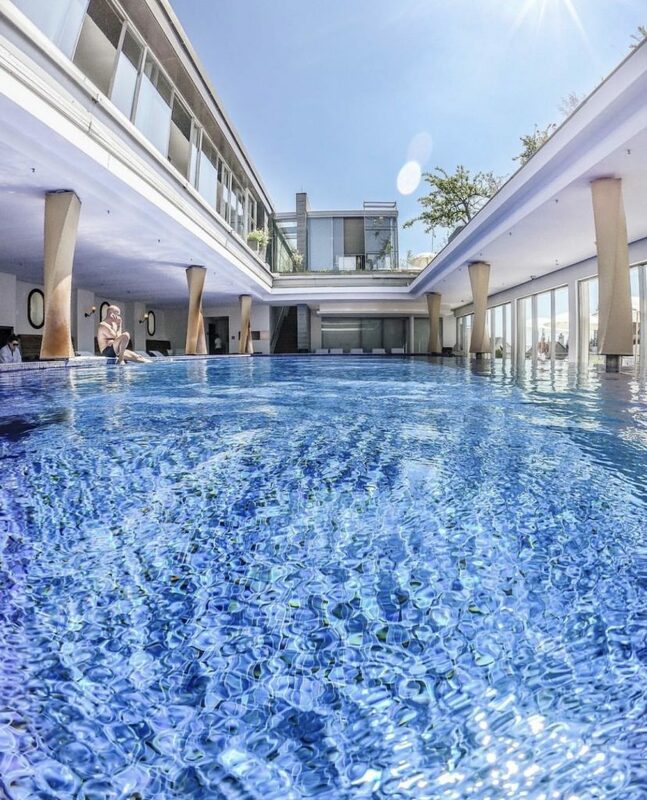 Bayerischer Hof offers a unique wellness retreat for body and soul. High above the city’s rooftops and also high above any expectation I might have had. 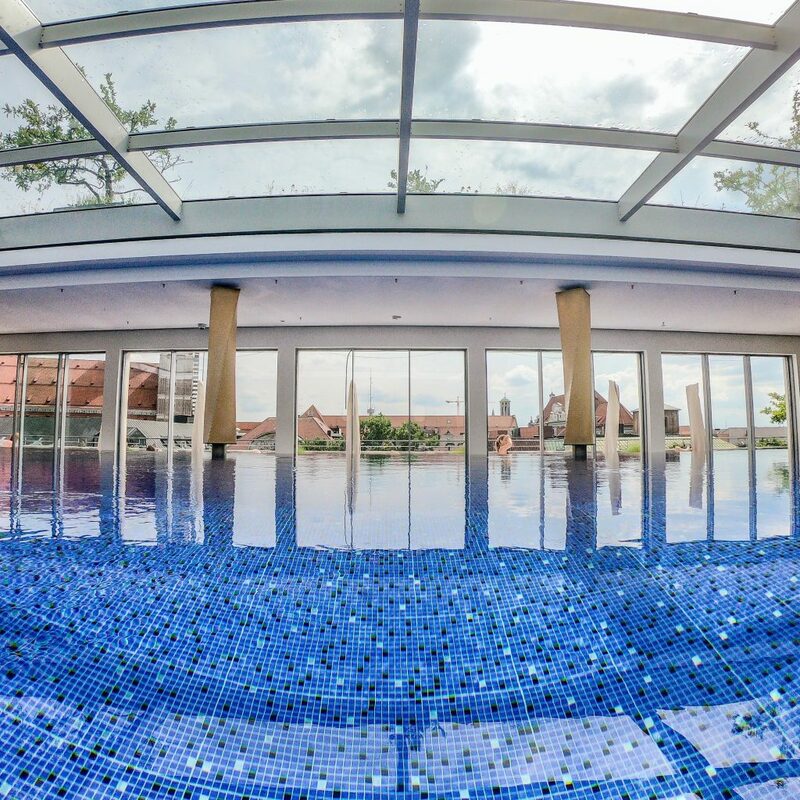 Let’s talk about the most stunning Spa in Munich! 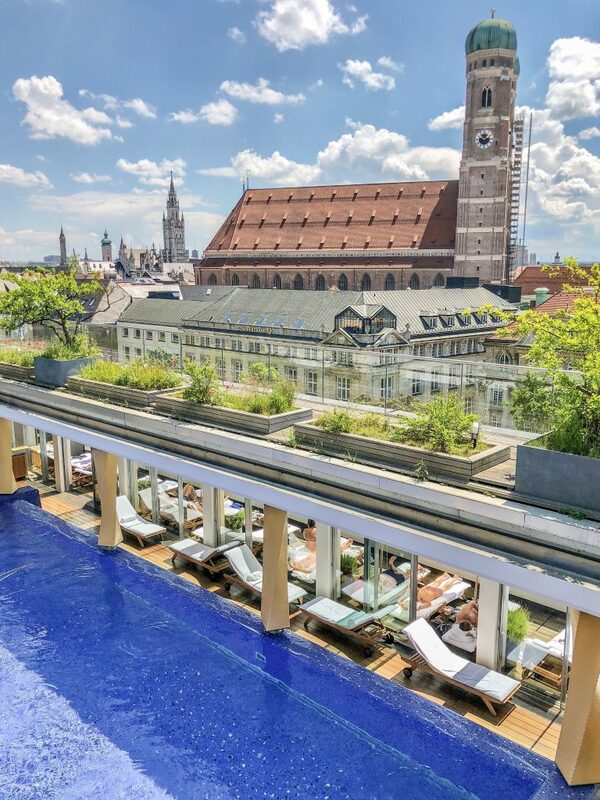 I mean a Spa situated high above the Munich skyline and which is quite literally the hotel’s crowning glory. 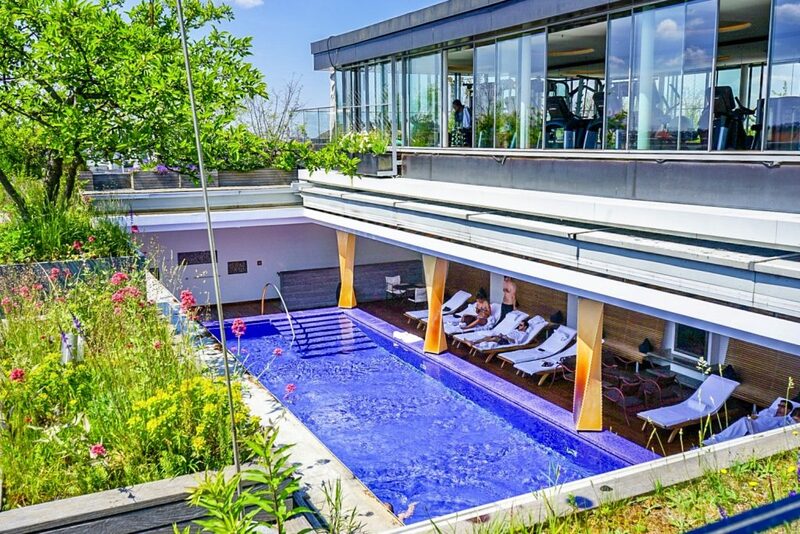 Designed by architect Andrée Putman, the Blue Spa is a unique four-storey wellness retreat for body and soul measuring 1,300 m2. 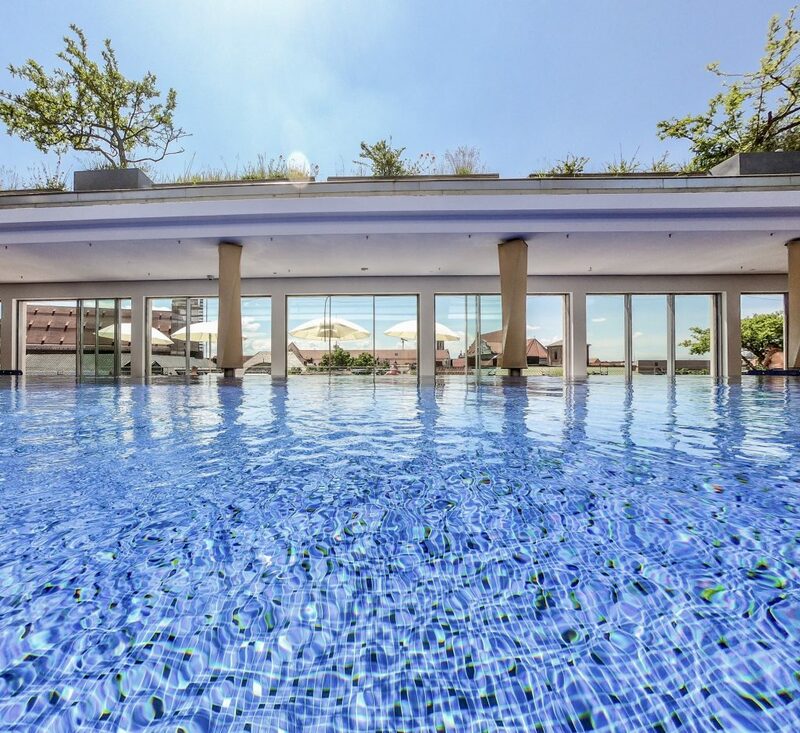 Guests are invited to go for a swim in the 6.50 x 14.50 m pool which can be turned into an open-air pool thanks to the sliding glass roof when the weather is nice. 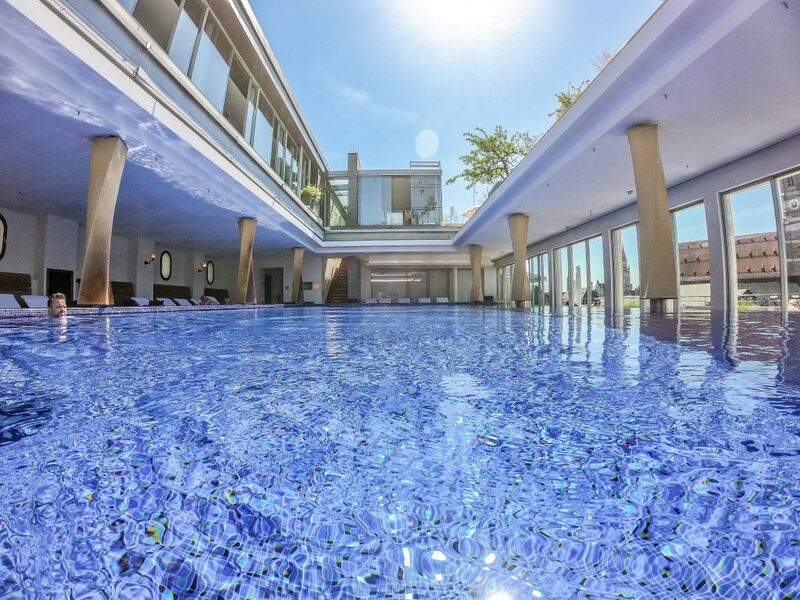 As you know me, this is where I spent most of my time while in Munich – either swimming in this gorgeous pool or sunbathing in the gorgeous terrace with the most amazing view. As a friend of mine told me before my trip – “the Spa is insane” and it truly is. There are plenty of types of saunas on site and as I am not a sauna person I only went there to take a look. 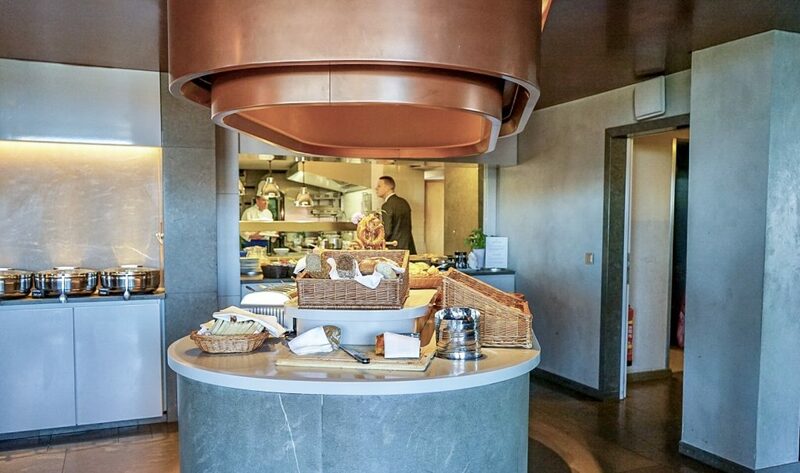 And what I saw is truly impressing – there is an extra gentle organic sauna in the ladies’s area, a mixed Finnish sauna with infusions and the classic aroma steam bath. An immersion bath and a separate quiet area are also available as well as a tanning bed. Good news for those not very used to German Etiquette in saunas (in most places people can only go unclothed): Bathing attire is allowed and it is up to the guest to wear it or not in the saunas. You know I normally don’t enter the gym while traveling but to this gym I swear I considered. But did not go because I’d better spend my time at the pool. Hahaha! Think gym with a view! That’s it! 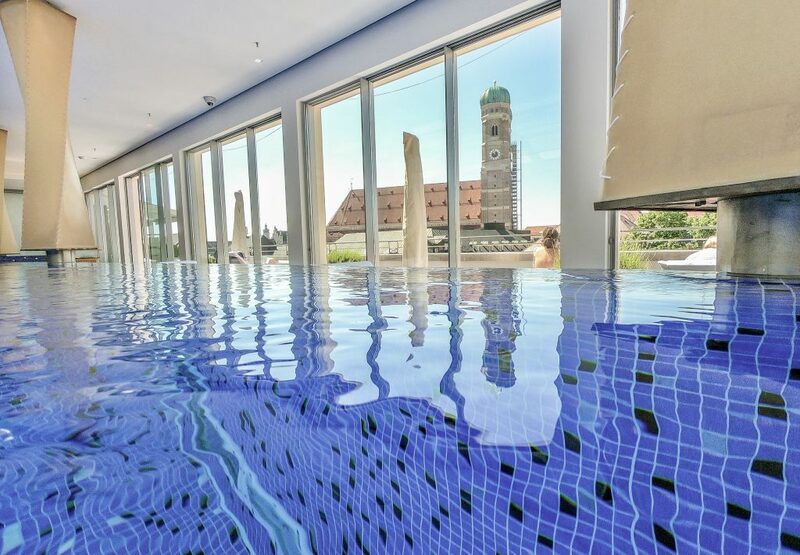 A gym with a view to the swimming pool and to the Munich skyline from the hotel’s highest point. The gym is state-of the-art and guess what? Ralf Möller, former Mr. Universe and a regular guest at the hotel, was on hand to advise about the gym’s range of strength and endurance equipment. Personal Trainers are available upon request. 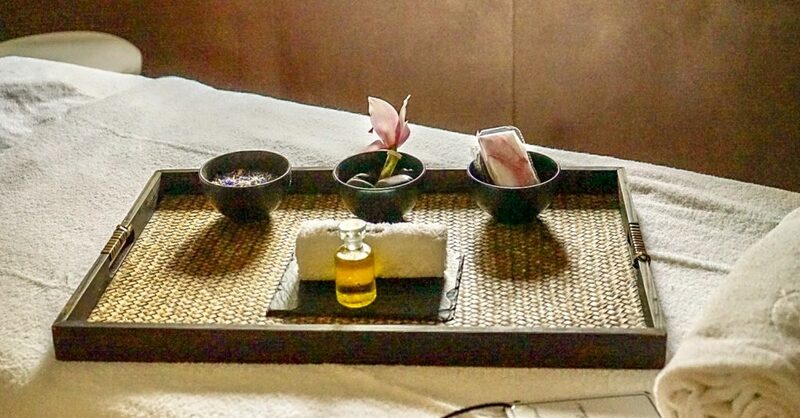 Indulge and unwind in a a classic massage to relax body and soul. Blue Spa brings together hand-picked spa therapists who deploy techniques from around the world. This is reflected in the wide range of treatments, which stretches from classic massage treatments such as sport, foot reflexology and deep connective tissue massages through to wellness treatments such as chocolate and hot-stone massages, Japanese treatments such as shiatsu and reiki and Ayurveda therapies that have been handed down from generation to generation. I decided to go classic and tried the Blue Spa Signature Treatment – there were so many options that were appealing that I chose one which could be adapted to my needs and which combines elements of four different massage styles: classic, aromatherapy, Shiatsu and Thai. So, I got all in one! Haha! Serious now: I went to heaven and fell asleep in a way that the therapist could not wake me up. I wanted to try again the next day but there was no more availability. So, book in advance. Private Yoga sessions can be booked and are customised to accommodate the personal needs of each guest. 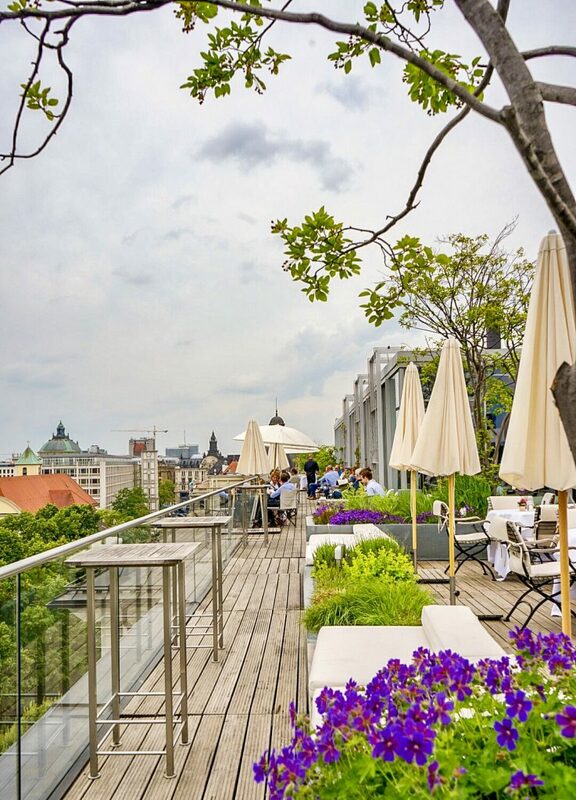 On my list for next visit to Bayerischer Hof. 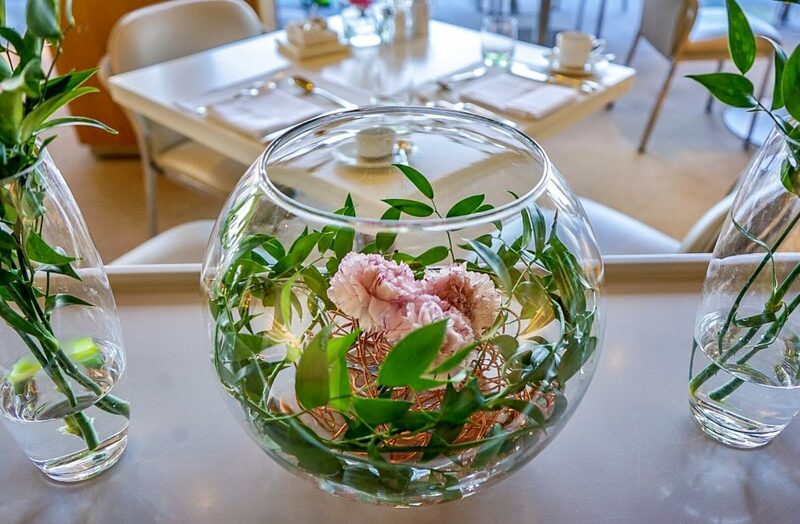 Arnoldy & Team are responsible for the guests at Bayerischer Hof and the saloon is open for non-guests too – I had a couple of hair cuts in the place many many years ago. Products are Kérastase. 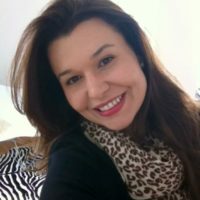 Liliana Schaubs and her team are responsible for selected cosmetic care treatments which can be personalised. Facials and firming treatments are on the list. 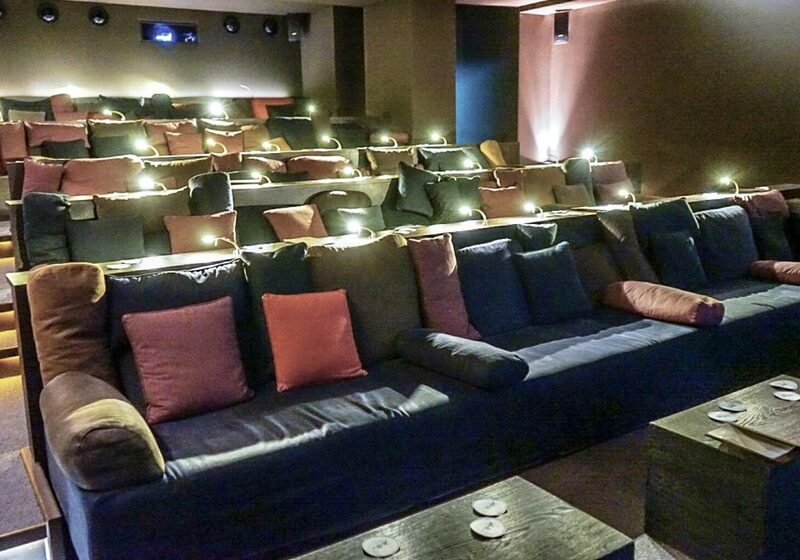 Have you ever been to a hotel featuring its own cinema? So cool! 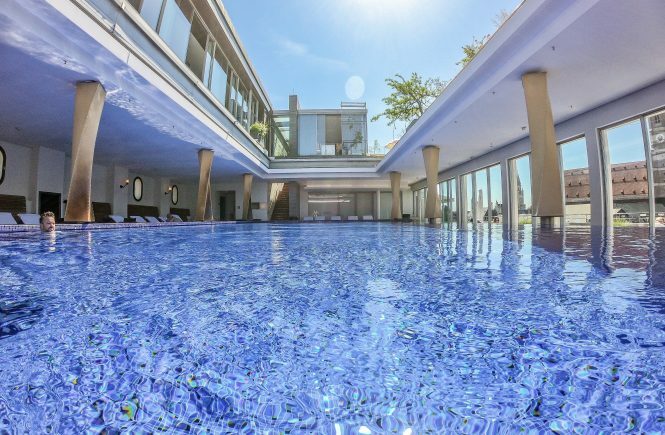 As if the cinema was not enough, the one at Bayerischer Hof is the first Astor premium cinema in Munich! There are 38 seats on comfy huuuuge lounge sofas and full bar service. In Brazil, in the US and some other countries these are very common amenities but in Germany it is still quite new and I definitely hope that people get more and more used to such comfort. Rocks! Bayerischer Hof has hosted some of the main jazz names since 2007. Some of the artists are João Bosco Quartet, Manou Gallo, Incognito, etc. See the event calendar in the hotel’s webpage. The New York at Bayerischer Hof concert series is held every spring and autumn and brings a touch of American jazz flair to the city. Musical highlights from soul to blues are the attractions. Munich is the German Carnival capital (people from Cologn shouldn’t´t read this!) and the celebration is taken seriously in the city. 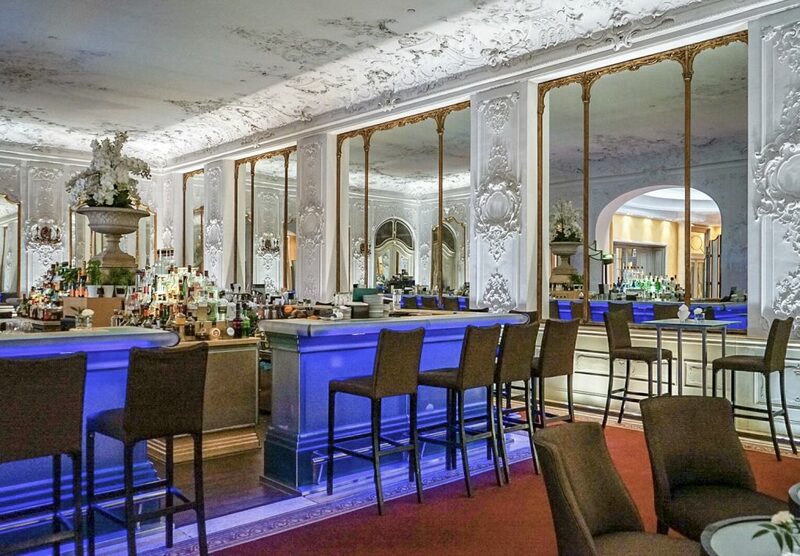 From the original fancy-dress party to the lively kids’ carnival, Bayerischer Hof offers many cool options to party. 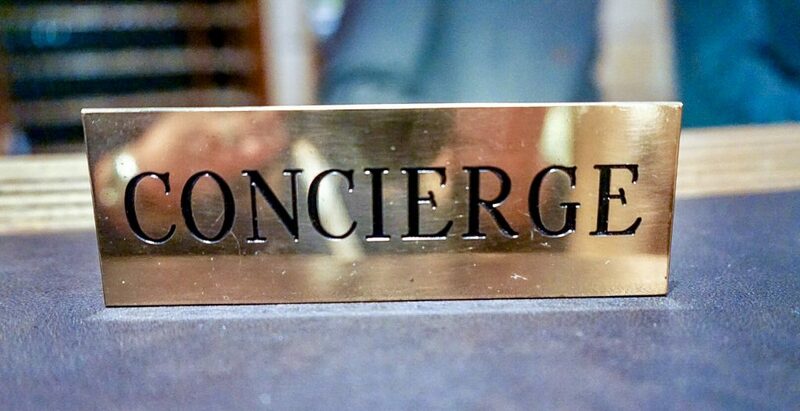 The concierge team knows everything about Munich and what matters in town from hidden restaurants to the most exquisite expositions. Even better, they will make whatever you wish happens. Make use of this great service! All year long! 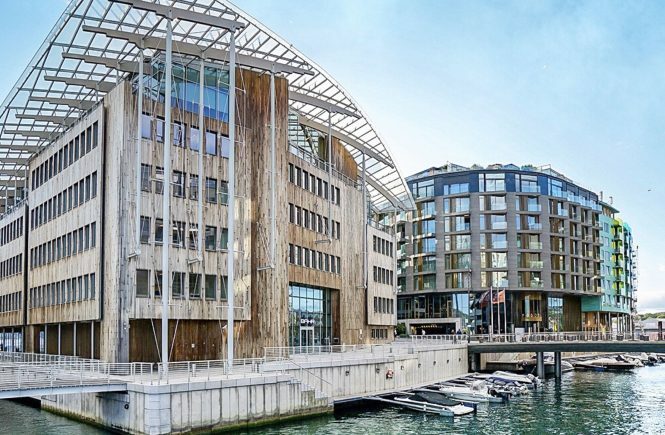 The hotel has a lot to offer at any time of the year and as I already mentioned, it is a city within a city with plenty of activities! 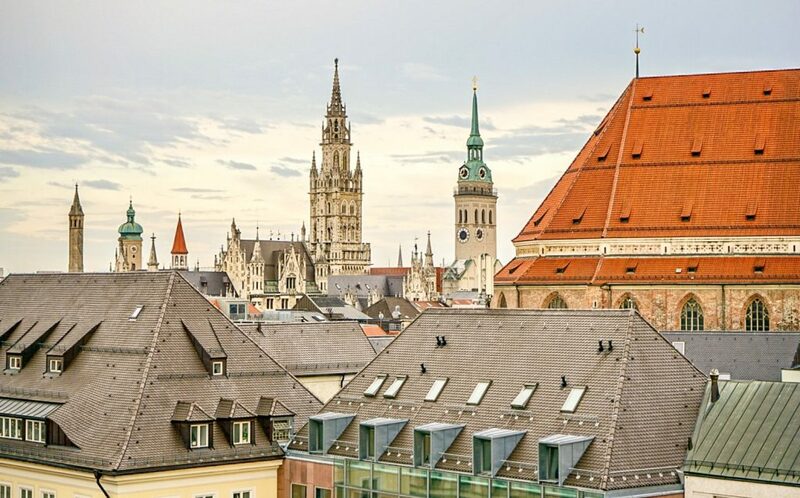 My personal taste, I love Munich during spring and specially during summer. I believe that the whole country gets more lively. Still autumn and winter can be very romantic and pretty as well. This is all folks! 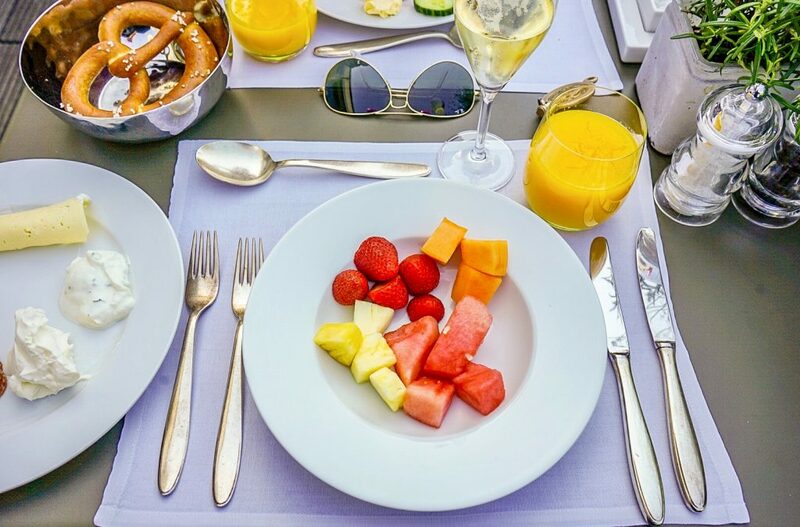 We had an amazing time and even though I knew that Bayerischer Hof was an über cool Grand Hotel, I got surprised with its grandeur, with the beauty of the property and with the sympathetic and attentious service. It became my home in Munich as I no longer have one there. 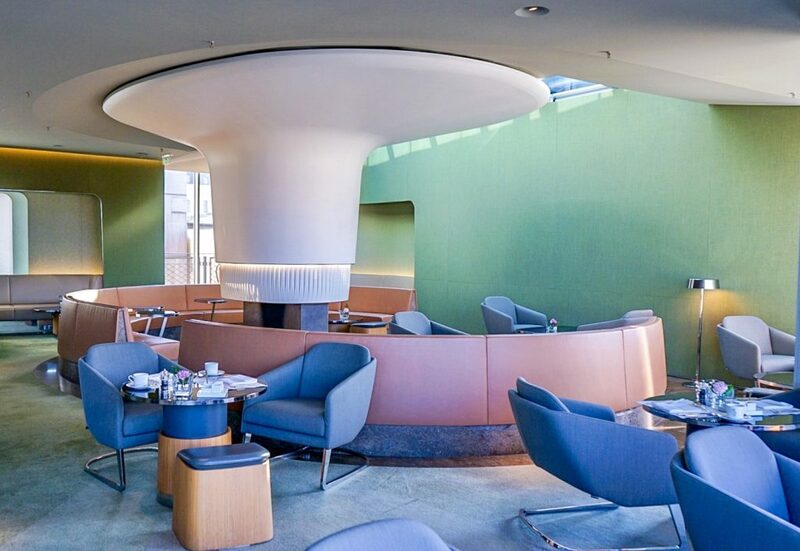 An experience per se in Munich, a place to always return. I hope you are travelling with me on Instagram @marineira.